There is so much going on with this comic of the day! McFarlane! X-Force! Juggernaut! Sideways! Ahhhh! 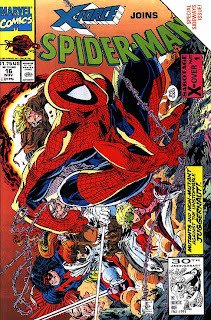 Spider-Man #16 is the last Todd McFarlane Spider-Man comic book. McFarlane had changed the way people began to draw Spider-Man by creating an iconic style which featured acrobatic positioning and imagery with movement that burst off the page. McFarlane's Spider-Man not only influenced a generation of artists, but his Spider-Man would influence his own future designs when creating his most successful artist owned character Spawn and his newest incarnation Haunt. 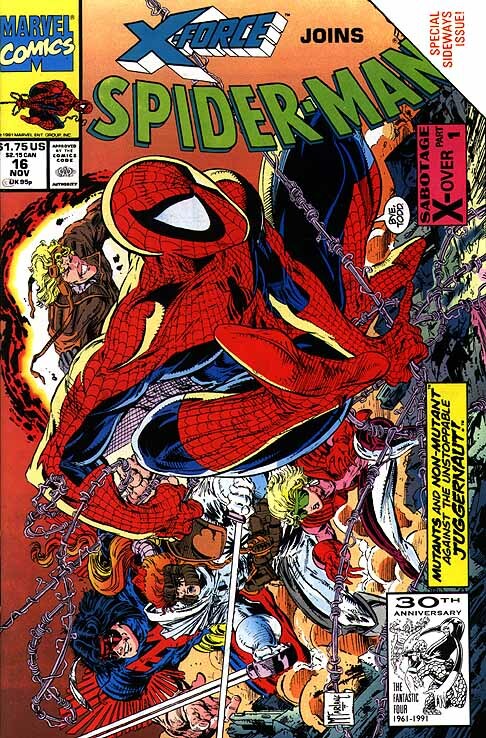 Todd McFarlane wrote, penciled and inked Spider-Man, but he never got the chance to have full power over the character, as he would later achieve with his Image Comics creations such as Spawn. McFarlane may not have been given full control over Spidey, but he was able to turn Spider-Man #16 on it's side, literally. The whole issue is filled with panoramic pages consisting of McFarlane's trademark style. The book is a little difficult to read in calender format, yet it makes for a fun memorable issue. From the beautiful cover in which Spider-Man says, "Bye, Todd" to the screaming Juggernaut as he awaits Shatterstar's sword-to-eye attack, the book looks great. Reading through the book makes me realize that McFarlane never was the greatest writer. The pacing is off because the story swings back and forth from Cable telling part of X-Force that he is serious about taking off to find the evil Black Tom Cassidy, and Spider-Man watching the inexperienced youth of X-Force members Warpath, Shatterstar, Boom-Boom, Cannonball and Feral trying to take down Juggernaut. The crossover continues in the X-Force books but I am unsure of how well Rob Liefeld continued the story seeing as he is from the same cut as McFarlane: artist first, writer third...right after inker. My last thoughts about this issue is in regards to one small panel which 10 years after it's drawing took on a very strong visual memory/meaning. There is a panel which shows one of the world trade center towers half destroyed due to a bomb going off inside of it (near the top). Almost ten years later, seeing the towers is still eye catching and quite dramatic.